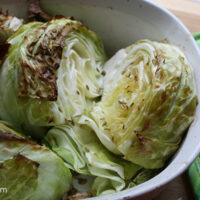 Roasted cabbage is tender and a little bit sweet. It’s tasty straight out of the oven or chilled for a cold side dish. It’s amazing how the flavor changes when you roast cabbage. Cabbage never calls out to me, and honestly I have no idea why that is! It’s a cruciferous vegetable, which means it’s related to my very favorite veggies: broccoli, kale, and bok choy. It has that distinct cruciferous taste that I love. I think part of what gets me about cabbage is that it’s a little bit overwhelming, you know what I mean? A head of cabbage is HUGE. How much Awesome Asian Slaw can one gal eat, right? Cabbage rolls are delicious, but they only use a handful of leaves, and you’re still left with this big, honkin’ head of cabbage taunting you from the produce drawer. 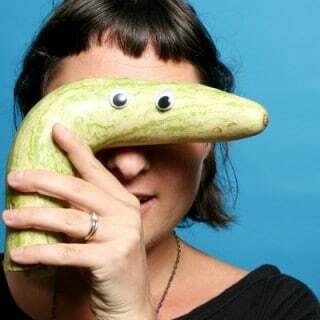 When our CSA delivered a giganto cabbage a few weeks ago, I stared at it for a long time. One good thing about cabbage: it keeps like a champ in the fridge. After a whole lot of staring, I decided to cut this sucker up and just into big pieces and make a big pan of roasted cabbage. Quick and easy! And the best part? It turned out great! I also discovered that roasted cabbage is actually a pretty well-rounded food. A quarter head of cabbage has around 4 grams of protein and 5 grams of fiber. All of that fiber and protein makes it nice and filling. 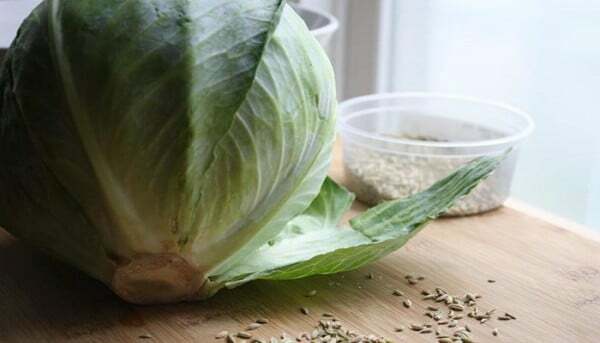 Cabbage is low in calories, but tossing it in olive oil like the recipe below ups that a bit, so you won’t feel hungry a few hours after you eat. You could really eat this dish as the main event, especially if you got crazy and put a handful of chopped cashews or walnuts on top. It also makes a good hot or cold side to go with food from the grill, if you’d rather not make cabbage the star of the show. Roasted cabbage is tender and a little bit sweet. It's tasty straight out of the oven or chilled for a cold side dish. 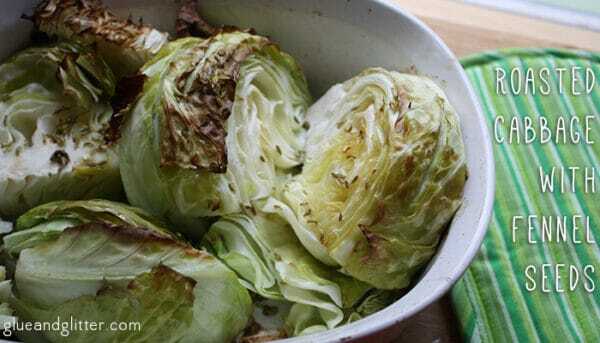 Cut your cabbage up into large wedges, and place them in an oven-safe dish. 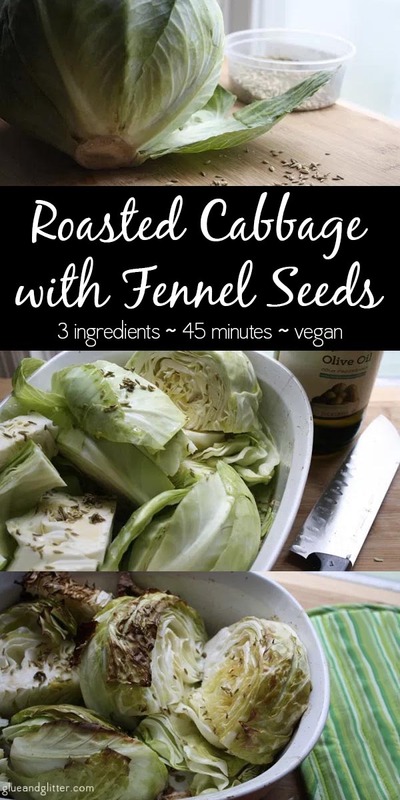 Throw in the fennel seeds, olive oil, salt, and pepper then gently fold everything together until the cabbage is nice and coated.